It is a beautiful day today…I don’t feel like staying in the office today, but as always, there is work to get done. But at least I will be outside later to see some of our middle school students play football. 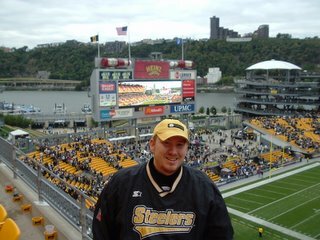 Just a catch up on the photo…that is me making my pilgramage journey to the mecca of football, Heinz Field in Pittsburgh. Unfortunately, on this ill-fated visit, Tommy Maddox threw the game away. I am preparing a sermon series for advent with it’s roots in C.S. Lewis book, The Lion, The Witch, and The Wardrobe. Pretty cliche since the movie is getting ready to come out, but I have always loved the book. I have recently re-read the book (as well as the whole series) and it just fascinates me to see the spiritual metaphors and images that are used in the book. Of course, I knew it was retelling the story of Jesus and our faith, but I had never read it with these open eyes. Week Two: Always Winter and Never Christmas: Bring Life to a lifeless world. Have any suggestions? Leave a comment. Otherwise, I am out. China Reportedly Shuts Down BlogChinese authorities have blocked a pro-democracy Web log after it was nominated for a freedom of expression award by a German radio station, a press freedom group said Thursday.Find out how to buy and sell anything, like things related to < HREF="http://www.credoninc.com" REL="nofollow">road construction of pa<> on interest free credit and pay back whenever you want! Exchange FREE ads on any topic, like < HREF="http://www.credoninc.com" REL="nofollow">road construction of pa<>!